All transactions are safe and secure with a reliable history in online purchasing behind each of our associates. 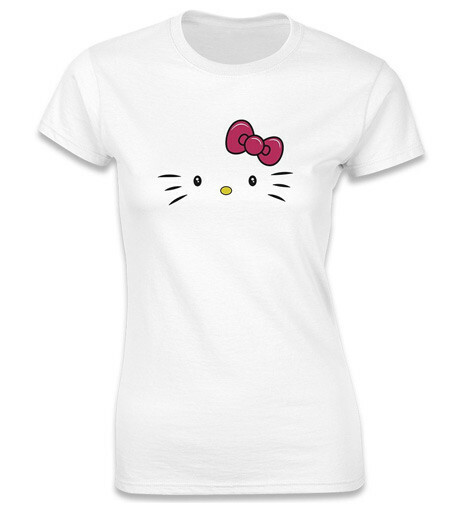 Buy the Hello Kitty Face t-shirt to own Hello Kitty clothing and merchandise. If you love a variety of styles, from the cute Hello Kitty shirts to the tanks and hoodies, then these Hello Kitty tees are a nice in between. The design features Miss Kitty's face as if she's peeking out of the material. Be prepared to get compliments because this creative concept will turn heads. If you think this design is out of this world, then capture one for yourself today. Also check out our Hello Kitty watches, jewelry, stuffed animals and bedding. In addition to the Hello Kitty Face tee above, browse the Hello Kitty Clothing Gallery for more apparel like men's and women's clothes, kids shirts or hoodies.